GIS technology maximizes the number of children reached. IRC Ethiopia has gained new insight into its development and relief programs. Success with ArcView software has led IRC Ethiopia to expand GIS into almost every project it undertakes. Every day, millions of rural children in Ethiopia do not attend school. Instead, they work on farms; dig in mines; or perform strenuous household tasks, such as gathering firewood or fetching water, which together can take several hours each day. For them, education is out of reach, both because poor families require the additional income and because many areas lack elementary schooling altogether. Map of villages in Boke Woreda, Ethiopia, that displays the number of out-of-school children in each village. Maps such as this were used to site new Alternative Basic Education schools/centers near the most potential students and near extant primary schools in the area. Based on this analysis, Qeelee was chosen as the site for a new school. Beginning in 2005, the United States Department of Labor funded the International Rescue Committee (IRC) to build schools and train teachers for community Alternative Basic Education (ABE) schools, which would serve as institutions to transition children from the labor force into more formal educational institutions, such as primary schools. Simultaneous community awareness and education programs promoted the benefits of education and encouraged families to send their children to school. In implementing the project, IRC wished to use the funding as effectively as possible. The first task was to locate each new ABE school within walking distance of as many out-of-school children as possible. Second, because the ABE program is designed to prepare children for more formal schooling, it was decided that each new ABE school should be within two kilometers of a formal primary school so that graduates of the ABE program could easily transfer to the formal school system. One further constraint on the program was that proposed school sites should be relatively near main roads in order to facilitate the construction process and program monitoring. The Ethiopian Education Office lacks the infrastructure and funding to maintain information on primary school locations, village school age populations, and distances between schools and village populations. Low-level road maps are also not available for most rural districts. The IRC Ethiopia program therefore had to build its geographic database from the ground up. Behar Hussein, the IRC Ethiopia GIS coordinator, trained eight people in the use of Garmin eTrex Vista GPS units to aid in the survey of 491 villages. The surveyors used Garmin eTrex Vista GPS for the survey. While four of the eight surveyors gathered geographic data about village boundaries, roads, health centers, water points, and primary school locations, the remaining four gathered demographic data from each village: the number of households, number of children of each age, and number of children of each age attending formal schooling. The data took more than 50 days to collect and was cleaned and compiled at IRC's Addis Ababa office. "It was much harder to obtain this data than downloading it," laughs Hussein, who performed the analysis using the office's ArcView program. He focused on children aged 6 to 11 years of age who were not enrolled in formal schools. First, he plotted the number of children not in school in each village; that map displayed several obvious locations for ABE schools that would be in close proximity to large numbers of out-of-school children. Of those locations, not all were within the proposed two kilometers of the nearest primary school. Potential locations were further narrowed down by their access to roads, which were extensively mapped out during the village surveys. IRC constructed ABE schools at 22 sites in each of the four selected rural districts, each site chosen to be close to a large number of children not already enrolled in school. Each ABE school was also within two kilometers of a government primary school, ensuring that the program and its graduates were integrated into Ethiopia's educational institutions. The proximity to usable roads meant that the construction could be carried out in a timely manner and that IRC could easily monitor the progress and enrollment at each ABE site. Following the construction of the 22 ABE schools and with continued funding from the U.S. Department of Labor, there are currently 4,120 children enrolled in the Alternative Basic Education program and preparing to enter more formal schooling. The program is currently expanding enrollment to vocational training for older youth. By enabling these children to further their education instead of laboring, the program improves their individual economic opportunities while simultaneously furthering the development of Ethiopia as a whole. 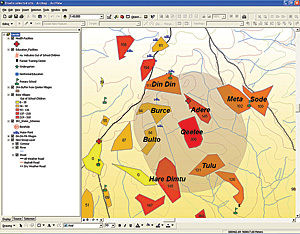 The obvious utility of ArcView analysis in this project's success means that IRC Ethiopia has expanded GIS into almost every project it undertakes, from developing project proposals to coordinating activities with other international organizations and from planning the sites of health centers to building new water points in refugee camps. 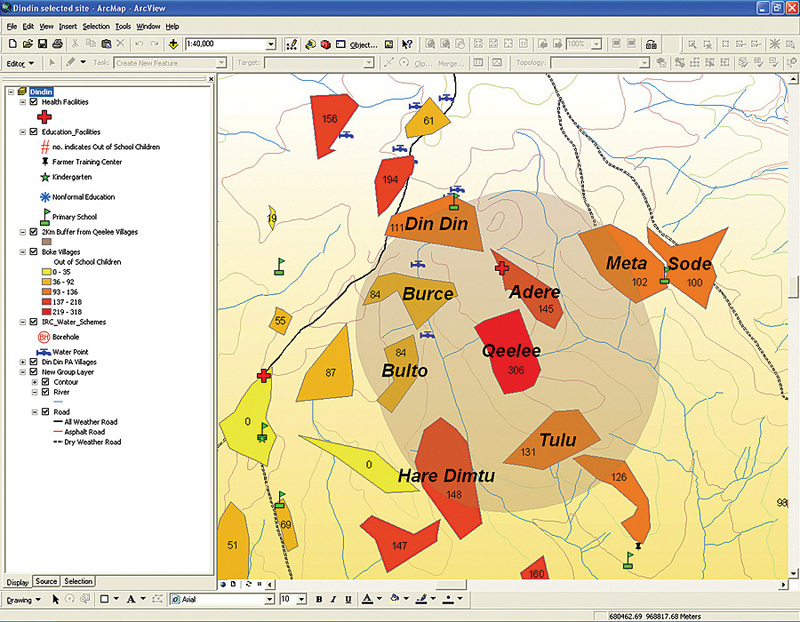 IRC Ethiopia's extensive use of GIS has given it new insight into how and where to implement its development and relief programs. "I think this is just a great example of efficient planning during project implementation," says David Murphy, the country director for IRC Ethiopia. "We used GIS tools to maximize the number of children reached by our program, ultimately putting our funding to its best use." For more information about this project, contact David Murphy, IRC Ethiopia country director (e-mail: davidm@theirc.org, tel. : 251-11-663-0479).